Where did I get it? Netgalley, thank you very much to Penguin Random House! What's it about? The novel has lots of different points of view which at first I found distracting, but once I got into it I liked it. The main characters are Natasha and Daniel. Natasha is black, and Jamaican. Her family came to America nine years before on tourist visas and never left - they are undocumented immigrants and are being deported on the day that the novel is set. Natasha doesn't want to leave so she's heading to see various people to try to stop the deportation. She is finding it hard to get on with her dad, who she blames for them being in this mess. Meanwhile, Daniel, who is Korean American, is heading to a Yale early entry interview. He hates his older brother, who's just been kicked out of Harvard, and he has strained relationships with both his parents, who are Korean immigrants and who don't understand his American ways of life. The two meet and feel an instant connection and throughout the day they ask each other questions, Daniel betting that he can make Natasha fall in love with him by the end of the day. They go various places, including to Daniel's parents' black hair care store. Interspersed with Daniel's and Natasha's points of view are little stories about some of the people they meet, their parents, and even a short history of black hair and why Korean people often own shops that sell black hair care products. 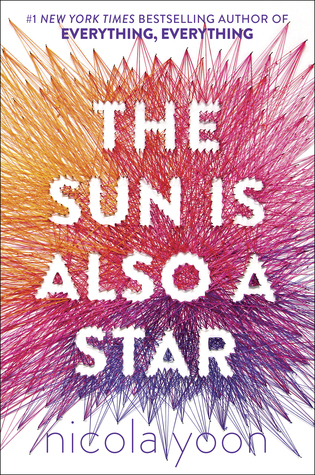 As an adult, I sort of rolled my eyes thinking about two seventeen year olds falling in love with each other immediately, but as the novel went on I got more into it and tried to think about how a teen reader would feel, and I think at that age I'd have loved the ideas of fate and the philosophy they talk about. 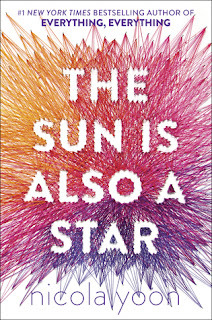 I decided to give it a full star rating because while it isn't perfect, I think it is a fantastic example of YA as a genre. Read it now! Are any main characters people of colour? Yes, both Natasha and Daniel. I liked very much the parts where they discussed how their parents wouldn't like them dating each other, and other parts about race.